Flowers are a huge part of the decoration at any wedding and the bride’s bouquet is one of the main focal points of the day, completing the bride’s look and featuring in most of the photographs. Much thought goes into the shape and colour of it and what flowers to use and like with a wedding dress, it is important to consider what to do with your bouquet after your wedding day. Your bouquet is more than just a bunch of flowers and it represents a huge day in your life. Often with wedding flowers, many couples choose to let their guests take centre pieces home to make use of them, donate them to their local church or leave them at the venue to be used. 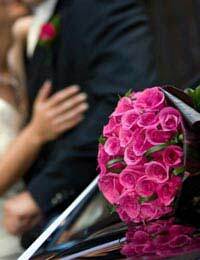 For the bride’s bouquet there are many different options to choose from when it comes to deciding what to do with it after the big day and there is something for everyone. One of the oldest wedding traditions involving the wedding bouquet is to throw it to the female guests at the wedding and for the winning person to keep it. The tradition is that apparently the woman who catches the flowers will be the next to go up the aisle. Nowadays most people don’t believe in the old tale but do it to carry on the tradition and as a bit of fun on their day. Some brides have their own little traditions for example, presenting their bouquet to their mother or their daughter on their big day as a way of thanking them for everything they have done for them or bringing it home with them to their marital home. If your bouquet is made up of fresh flowers, drying it or even just a small selection of flowers from it as a keepsake from your wedding day is something you can do yourself at home. To dry your flowers, simply hang upside-down in a warm, dry place for approximately a week or until completely dried out and then tie with a ribbon matching your colour scheme for a nice little reminder of your wedding day. Some brides choose to have artificial flowers instead of fresh flowers. This is not a very common choice but with the quality of artificial flowers extremely high and realistic, it is becoming increasingly popular and means that a bride can keep her bouquet unspoiled forever as the flowers will never spoil. There are lots of little unique and personal things that people can do with their bouquet after their wedding day. Some brides like to use it to pay respect to family members or friends who have passed away by placing it on their grave after their wedding day as a way of remembering them. No matter what you decide to do with your bouquet, it will be a nice little touch to either remember your day by, remember family or friends who can’t be with you or brighten up someone else’s day.